Update: 2 years after I wrote this article, I decided to start selling a few organic fertilizers, so I’ll put links to them below. Soil building fertilizers are mostly mineral fertilizers such as calcium carbonate. 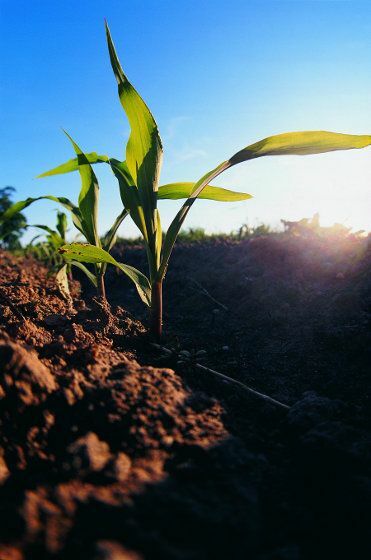 You generally use them based on a soil test to balance out the ratios and percentages of specific major nutrients in your soil, such as calcium and magnesium. The timing for your garden fertilizer schedule is that it should be done in spring or fall. Actually, it’s nice to divide the application in two and do it in spring AND fall if possible. If you go to the website of the evil Scotts fertilizer company or indeed most fertilizer companies, you can find their fertilizer schedules. They’ll often have the applications divided into four times throughout the year. This number of applications would actually be okay, IF you were doing these fertilizer applications based on a soil test. It’s not a great idea to apply the common N-P-K brands (nitrogen-phosphorus-potassium) such as 10-10-10 fertilizer 4 times per year just for good measure, but if your soil test told you that you need 40 pounds of calcium carbonate per thousand square feet in order to increase your calcium levels, then it would certainly be good to do that. In terms of when to fertilize, I tend to split it into two applications because life gets busy, plus it’s easier to apply mineral fertilizers to the vegetable garden during early spring and late fall when many of the plants aren’t there. But what to apply for long term soil building? If you haven’t done a soil test, I feel okay recommending 10 pounds of calcium carbonate once per year. Other than that, you don’t want to apply concentrated forms of any nutrients without a soil test. The odds are good that you’d make things worse by applying common N-P-K fertilizers indiscriminately. But the fertilizer companies did get one thing right. If you’re using an appropriate organic fertilizer for your soil, then it’s true that a fertilizer schedule of small, regular applications are better than one big dump. These regular applications are especially useful for the more quickly available organic fertilizers you can use throughout the year. I often call these biostimulants. Many of them are in liquid form. These are products like liquid seaweed and sea minerals that are full of tiny amounts of 70-90 different minerals, which are important for many aspects of plant growth. They’re sprayed directly onto plants and soil where they can be used right away by both plants and microorganisms. They can really improve many aspects of plant growth and nutrition. And they’re important for soil life, too. I use the lowest suggested application rate for these kinds of products, and use them on a monthly basis. You could even cut the rate lower and user them weekly. There is good research showing that using organic fertilizers more often, in lower doses (often extremely low doses), promotes the best results. Long term soil building fertilizers are used based on a soil test in spring and/or fall, or perhaps even spread out four times per year. Short term plant building fertilizers like liquid kelp are used more often, such as monthly, many of them without a soil test. Any questions about when to fertilize? Let me know below. Noooooooo, Phil! Lime is not a good idea! Many of us have alkaline soil to begin with! My dad once took the recommendation of his buddies and applied lime to my mother’s vegetable garden. (It was the only thing he did in the garden since turning up the sod.) That great little veggie patch turned into an unproductive wasteland. A rule that is generally used for pruning should be used for fertilizers, too: if you don’t know why you are doing it… DON’T. Thanks for your comment – I agree on the pruning, but have to disagree on the lime.But to be very clear, I absolutely do not recommend dolomite lime – that’s where the problems come in. And I don’t recommend a big application of lime without a soil test – only 5 pounds per 1000 square feet, not 50-200 pounds as the labels recommend. Five pounds is just a light dusting that you’ll barely be able to see after doing it. Probably 95+% of soils will benefit from it. Also, calcium does not necessarily increase alkalinity.Thanks again very much for the comment. No Calcium does increase alkalinity. If you understand what organics is about then you should not be adding all this crap to your soil. Spraying the leaves is another NO NO. Plants transpire 24 hours a day. When you spray crap on the leaves you are force feeding the plants. Not a good idea! Plants are a little like us we eat some foods even if we don’t need them. Plants are the same they will uptake good and bad. When a plant can’t take up the water it needs. It will slow down the transpiration trying to hold onto moisture. Also not a good thing. Plants feed when the light is strong enough only. Plants never uptake nutrients at night. At night they only uptake water. A plant has 2 systems of roots. there are tap roots that uptake water. Then there are the finer hair roots that uptake soluble foods. If you must feed plants and I do say if you must ONLY feed plants in the morning. As they say in all bird sanctuary’s don’t feed the birds. Because it is not good for them. The same applies to ALL plant life. If you set up your garden properly you don’t need all the other bits of rubbish from the shops. We only started using all this rubbish in the last 60 odd years or so. The soil food web has been on the decline ever since. Regards, Barry. You make a couple of reasonable points Barry. I disagree, however, with others, and with your overall message – I’ll address them next week. Thanks for you comment. Great post and discussion going on here Phil.Barry, there’s a “train of thought” that foliar fertilising, combined with slow-release fertilisers, actually improves both the plant – and the soil.While it is a new train the benefits are proving very efficient – both for the plant and the soil. We don’t have to do things as we’ve always done them to remain “organic”. IMHO, our understanding of organic gardening is growing and should continue to grow. Great article Phil. I understand Marie’s concern, however, there is a HUGE difference between the soil effects of calcitic lime (which Phil recommended) and dolomitic lime as Phil mentioned above. We’re talking very small amounts of this stuff (5 lbs over 1000 square feet), so much so, that we’re almost applying it like we would a homeopathic remedy…we’re embedding the energy of the calcitic lime into the soil rather than truly attempting to correct underlying nutrient deficiencies.I also think it’s important to include a source of simple sugars/carbon in all fertilizer applications (foliar or soil). Phil, slightly off the subject. My garden is all raised beds. It would be very costly to run soil tests on all 13 beds. What to do? If the raised beds were built with the same materials, you can just take a sample of soil from each of them, mix them all together, and have that tested. Do you have a sources page where this “good reaserch” is. I am using your website as a starting point for my thesis research into soil amendments and sustainable agriculture. Hi Charles, yes I’ll post it in my next blog post this weekend. I am 47 and have been an avid producer of food using no commercial herbicides/pesticides for decades – my greenhouse is 30×100 and operates 10 months of the year. Our garden is 3 acres – the corn patch is 5 acres along with thousands of strawberries/blackberries/raspberries/grapes near the orchard that contains about 100 maturing fruit trees. I plant by moon phases as grandpa did…he always said alittle lime makes it sweeter! I add leftover ashes and brunt wood chips all over the garden and grow watermelons directly overtop of brunt brush piles. When I spray fish emulsion (homemade from catfish/crawdads/crappie/bass out of our pond) I spray in 50 gallon increments directly on any and all plants and trees…as well as direct spraying of neem and horse/chicken/pig manure tea….I produce my own straw so I actually cover my garden in straw – and load down with tons of shredded leaves every fall…top it off with grass clippings and wala! No other ferts needed…millions of worms and PERFECTION! Great article Phil. Sounds like you’re doing a lot of things right and producing a lot of healthy food, no doubt! I’ve always heard that Lime is a good idea, too. But thanks for clarifying about the dolomite lime. I’ll keep that in mind. Overall, a great and helpful post. How often would you suggest spraying or soil drenching with molasses? Do you do that on a regular basis, on a lwan for instance? I do once/month, mixed with microbial inoculants and other biostimulants like sea minerals. Sorry for the typo! I meant lawn, not lwan! Often if your soil is really imbalanced, sugar is apparently better than molasses. The application rates sounds about right. Can you recommend commercial sources of sea minerals and/or do you have a favorite(s)? Thank you. Hello Phil, I want to ask if I am understanding these dynamics correctly: Am I right to say that the base saturation test tells me how much weight per acre of each element I have, and the Lamotte results show me how much of those #s indicated in the base saturation results are actually available for the plants to absorb; and then the amount of phosphorus in my soil is what makes the portion of the elements that are soluble available? In other words, the phosphorus is what determines how much of the elements in the base saturation result become available, as indicated in the Lamotte results? I understood you to say that the amount of phosphorus in my soil is what makes the calcium available (thus increasing the #/acre in the Lamotte results), but what is it that makes the rest of the elements rise in the Lamotte portion of the results? I hope that makes sense. Great questions Michael. You’re right about the difference between base saturation and Lamotte. But it’s not that the phosphorus amount changes the other nutrient amounts on the soil test, at least not to my knowledge. The Lamotte test shows how much of each nutrient is more easily available to plants from the soil, but other things still have to happen for the plant to actually use those available nutrients, having access to sufficient phosphorus being a big one. Phill thank you so much for all your advices. When it comes to fertilize for Short term Building Fertilizer, I understood to do it in the liquid form about once a month. If I were to do it with granular fertilizer what kind of a schedule should I follow, once a month, every other month or every three months could you please comment on this question and I greatly appreciate all your help you can give me. More often is generally better. That doesn’t mean you apply more overall, just that you apply less of it, more often. Monthly is great.